Being a Templar isn't all that. The Catholic Church hunts you down and when you think you're safe hidden away in the shadows, a bloody assassin stabs you in the neck. From behind! Still, it has its perks. One of them is to send masses of mercenaries, or people you've manipulated into following you, to their death -- in waves, of course. 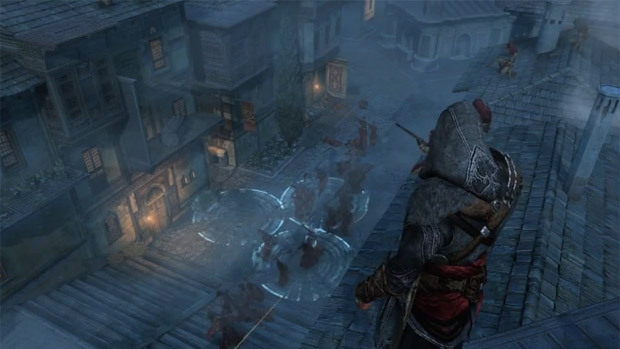 Den Defense is a feature in Assassin's Creed: Revelations that lets Ezio help out the freedom loving Ottomans in a tower defense mini-game. Dens are the new Borgia Towers, and they need defending. You can add better defenses as you kill Templars and raise morale. It looks like a fun little distraction between all the platforming and the "eeeeeeeeiiiiiiihhhh!" sounds you'll hear whenever you jump into a bale of hay.